CarGurus has 760 nationwide ES 300h listings starting at $10,950. Those looking for a plush commute without excessive fuel usage and emissions anxiety might want to check out the 2016 Lexus ES 300h midsize entry-level-luxury hybrid sedan. This 5-passenger 4-door offers all the passenger room, perks, and driving style of its fellow V6 ES 350 model, but without the carbon footprint and the added fuel stops. The ES 300h even offers a number of upgrades for the upcoming model year. Available only in a single Base trim, the 2016 ES 300h comes with front-wheel-drive (FWD) and remains one of the roomier midsize premium commuters on the market. One major difference between the ES 300h and ES 350, however, is in trunk space. Carrying its standard rear-mounted nickel-metal hydride battery pack, the hybrid ES offers only 12.1 cubic feet of cargo capacity, compared to an extra 3.3 cubic feet in the ES 350. At any rate, though, the 2016 ES 300h arrives with a larger grille, improved cabin sound insulation, bi-LED headlights (low beams only), a new steering wheel and upgraded shift knob, and a few additional interior fabric hues. Also new for the 2016 ES 300h is the Lexus Safety System +, which now boasts pre-collision braking and pedestrian-detection technology along with lane-departure alerts, intelligent high-beam control, and adaptive cruise control. An improved Enform Service Connect function provides smartphone apps that alert owners to vehicle maintenance and servicing issues. And a couple of extra buttons appear on the Remote Touch Interface controller when the optional GPS navigation system is installed--although be advised that reviewers remain wary of its ease of use even after this small upgrade. Powering the 2016 ES 300h is a 156-hp 2.5-liter Atkinson hybrid inline 4-cylinder (I4) gasoline engine that mates with an electric motor to put out a total of 200 hp. A continuously variable transmission (CVT), itself essentially another electric motor, offers instant torque, but its actual torque numbers remain unavailable. Regenerative braking and the I4 both provide a constant charge, allowing the ES 300h to cruise on all-electric power for an unspecified distance, which, of course, contributes to an impressive 40 mpg city/39 highway/40 combined. Three driver-selectable cruising modes, Eco/Normal, EV only, and Sport, allow you to tailor your drive to your mood and fuel budget. Being a Lexus, the 2016 ES 300h lives up to a certain standard of luxury. 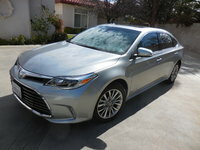 Returning appearance features include 17-inch alloy wheels, LED headlights and taillights, a power sunroof, heated power-adjustable mirrors with memory for driver settings, and a rear spoiler that distinguishes the hybrid from its more pedestrian ES 350 sibling. Interior features include leatherette upholstery, power-adjustable front seats, and full power accessories. Cruise control and telescoping tilt-wheel steering also remain standard, along with a remote garage door opener, a rear-view camera, and dual-zone automatic climate control. Standard technology for the 2016 ES 300h includes Lexus’ upgraded Enform infotainment with its improved remote system complemented by Bluetooth hands-free functions and a 7-inch touchscreen display. Entertainment remains a single CD/MP3 player boasting 8 speakers, satellite radio, and a USB port. Options again come mainly as packages, like a Navigation package with GPS navigation, an upgraded 8-inch display, and additional smartphone apps, and a Premium package that sports a power-adjustable steering wheel, added memory for driver settings, and genuine wood cabin accents. The available Luxury package tosses in leather upholstery and heated and ventilated front seats, while the Ultra Luxury package adds a driver’s seat cushion extender, memory for front passenger seat settings, and ambient cabin lighting. Standalone options include the new bi-LED headlights, front and rear parking sensors, and select features from certain packages. Standard safety features for the 2016 ES 300h include 4-wheel antilock brakes (ABS), traction and stability control, front and rear side-mounted airbags, front and rear head-protection airbags, turn-signal-integrated mirrors, daytime running lights, and front fog/driving lights. A post-collision safety system and remote antitheft alarm also return standard, while optional safety equipment includes (aside from the new Lexus Safety System +) blind-spot monitoring with rear cross-traffic alerts. The ES 300h gets a top score of 5 stars for overall crashworthiness from the National Highway Traffic Safety Administration (NHTSA), while the Insurance Institute for Highway Safety (IIHS) awards the closely-related ES 350 its highest score of Good in all categories. Lexus’ gas-electric 2016 ES 300h again challenges such rivals as Lincoln’s MKZ Hybrid and Honda’s Accord Hybrid. Lexus’ parent company Toyota also offers its well-wrought Avalon Hybrid to folks who want a hybrid experience similar to the ES 300h without the higher price tag. 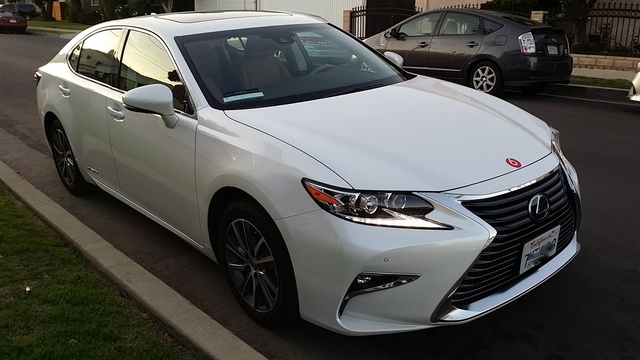 What's your take on the 2016 Lexus ES 300h? Have you driven a 2016 Lexus ES 300h?